To download this entry as a reprintable PDF, click here. Do you lack heating in your home? These ten tips will help you stay warmer. 1. If you start feeling cold, get moving. Jump up and down or do jumping jacks every time you feel a chill. If you have trouble moving, voluntarily force yourself to shiver. You can also shake your arms, your legs, your head, and your hands. The more you move, the warmer you’ll get. Talking to others — and yourself! — will also help. 2. Wear dry clothes. If your clothes get damp, remove them, including underwear, and put on dry clothes. 3. Eat! When you feel cold, you can quickly generate warmth by eating sweet foods like candy bars, hot liquid Jell-o, and sweet breakfast cereal. Beverages like hot chocolate and milk with added sugar are good whether served hot or at room temperature. If you like coffee or tea, add sugar — real sugar and lots of it — to help you warm up. In addition, eat complete and nutritious meals throughout the day to maintain your energy and do not skip dessert. This is not the time to diet. Have a snack before going to bed. 4. Sit on a cushion. When you sit down, sit upon something that provides insulation between you and whatever you’re sitting on. These are good: a cushion, a pillow, a piece of foam, a towel, a spare piece of clothing, a yoga mat, or a blanket. Avoid sitting directly on cold, hard surfaces like metal or wood chairs or benches or floors. 5. Wear layers of clothing. On top, layer-up like this: first a t-shirt, then a long-sleeved t-shirt, then a baggy button-down shirt, then a hooded sweatshirt or sweater. On the bottom, layer-up like this: first underwear, then sweatpants, then jeans. Loosely-fitting stockings are also a good first layer. 6. Wear loose-fitting, baggy clothes. 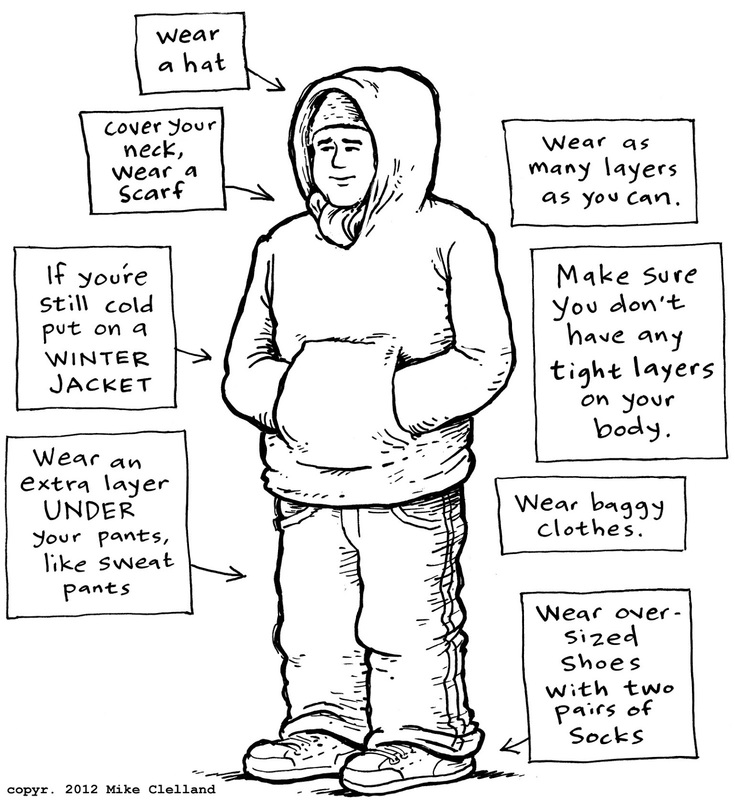 Avoid tight clothing, which may inhibit circulation to your extremities and which may, in turn, make you feel cold. 7. Wear a hat, and a scarf, and a hooded jacket. Instead of a scarf, you can also tie a dry towel or shirt or wrap a men’s tie loosely around your neck. 8. Wear two pairs of thick socks and a pair of extra large shoes. The socks should be thick, warm and non-constricting. Find shoes that are big and loose enough that you can comfortably wear them over your socks (you may look goofy, but you’ll feel warmer). 9. Cover all exposed skin, including hands, ears and neck. Wear mittens, gloves or thick socks on your hands. Button all buttons. Wear a hat that covers your ears. Pull up your pants. 10. Put on a thick, insulated winter jacket if you’re still cold during the day. If you’re still cold at night, wear all your layers to sleep and cover yourself with blankets. Permission is granted for reprints as long as: no fee is charged for those reprints, no changes are made without permission, and the writer and artist are credited as listed here.